Adibael Hainnabibi is a Dunmer scout and the master trainer of Athletics who can be found in his yurt located in Kaushtababi Camp. He also offers major training in Long Blade and medium training in Block. Assurdan Serdimapal next to him is also a trainer. Though less experienced, he is cheaper, until you need the more advanced training. He wears an expensive shirt and common pants with matching shoes. He carries a random Ashlander weapon and a small key that opens a nearby chest. 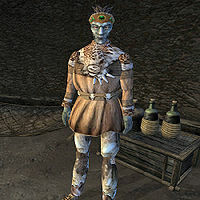 Aside from his natural resistance to fire and the sanctuary provided by his ancestors, he knows the following spells: Burden, Heavy Burden Touch, Fierce Fire Shield, Fierce Frost Shield, Fierce Shock Shield, Great Levitate, Wild Levitate, Second Barrier, Third Barrier, Fourth Barrier, Vivec's Kiss, Soothe the Savage Beast, Calming Touch, Calm Creature, and Calm Humanoid. This page was last modified on 23 November 2018, at 06:10.